One of the first businesses in the U.S. portfolio of Cemex S.A.B. de C.V. unveiled a new color scheme last month, paying homage to its more than 70-year history in the city. Houston Shell & Concrete serves approximately 1,000 customers annually, offering experiences unmatched in the Houston market by providing personalized and flexible options to smaller contractors. While other local concrete suppliers often require a minimum of 10 cubic yards per order, Houston Shell & Concrete can deliver as little as three cubic yards for smaller projects. “Our customers can request custom mixes and delivery schedules to fit their project needs,” says Sales Representative Guadalupe Vasquez. 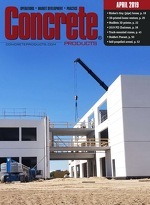 As part of the global building materials leader Cemex, he adds, Houston Shell & Concrete can have trucks load at 21 Greater Houston-area locations and offer delivery options as early as 4 a.m.
“With HSC, customers can get superior customer service while taking advantage of the technical expertise and locations of Cemex to serve their unique project requirements,” affirms Houston Shell & Concrete Manager Carlos Lemus. “HSC gives do-it-yourselfers and local contractors special attention with truly customized service that fits not only their needs, but their project schedules.